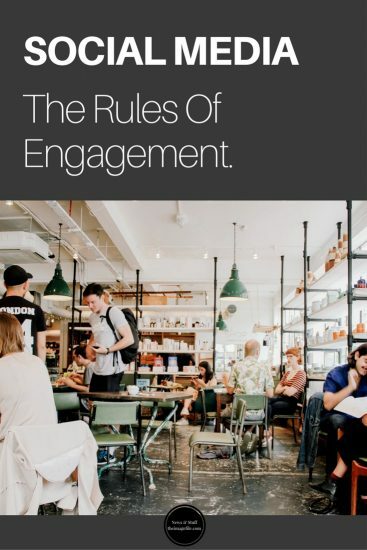 Social media, the rules of engagement! Ok, so the above quote is all about war and we’re hardly at war here but the lesson rings true. If we simply go through the motions and deliver the same products and promotions as everyone else, we will move at the same pace. If we can be creative, try to produce some smart content based on how we see ourselves and what our product or service can deliver, then we stand more chance of gaining traction with customers. A surprised person is more likely to change their action of just browsing and actually make a purchase or an enquiry. 1. All that glitters is not gold. Social media is relatively shiny and new, but it is not the new way of doing things. It is part of the ongoing marketing spread of options and the way to engage means the same as it does when you’re face-to-face with a prospect. 2. Social. This leads on from the previous point and a reminder that the underlying aspect of social media is the ability to connect and be social. It is not the answer to your sales pipeline but it will provide the priceless opportunity to interact with your audience and potential customer. 3. Respect boundaries. The biggest hoo-ha about the internet and social media is the lack of privacy. In general most users have accepted this aspect but this doesn’t mean everyone is open door. As you would in person, respect people’s space and be polite. 4. Helpful and friendly. As with being polite, the basics of human interaction should not be forgotten in the virtual arena. 5. Personally exclusive. Customers are looking for an edge, a reason to spend their money with you as opposed to your competitors. Find a way to make them feel special, a personalised guide to how you might cover their wedding or event. 6. Public space. Social media is a public forum, much the same as a high street shop, and so anything you do there is a direct representation of your service. Make it good, correct and impressionable. 7. Not just about you. You have your company profiles but this shouldn’t stop you engaging elsewhere on other company’s feeds, making your presence and voice felt. This is a form of PR and a part of your networking approach. 8. Have a plan. Social media provides a great opportunity to watch everyone else but this does not get you anywhere. Be proactive, set targets and make it work for you. 9. Be agile. The instant nature gives you a massive opportunity to react and change offerings in real-time. Don’t under-sell but show your willingness to remain flexible. 10. Have fun! This social profile is still you and customers will engage with fun and enthusiasm, as well as quality service. Have You Spring Cleaned Your Business? Why Should I Start A Blog? Social Media: The do’s and dont’s Advanced Contact Page Update!